T-shirts are white compacted 100% cotton heavy-weight jersey knit with full athletic cut, ribbed crew neck, deep armholes, extra-long body. Necks are nylon reinforced. Bottom and sleeves are hemmed. Orange traditional Stewart cowboy logo in star imprint in center chest. 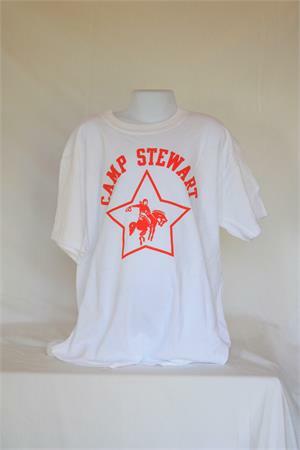 These are what campers wear everyday.